Cannabis (marijuana) is legal in high-rise condo buildings despite most buildings constructed without a way to prevent smoke and odour from migrating between units and common areas. Legalization occurred without apparent consideration of condo living including the safety and security of building residents. It is now up to each condo community to determine how best to deal with the use of cannabis in their community. Some communities have adapted by prohibiting or restricting its use in buildings. Those failing to adapt, or which have not adequately modified their governing documents so they are upheld if disputed, could be faced with escalating costs to protect affected residents. 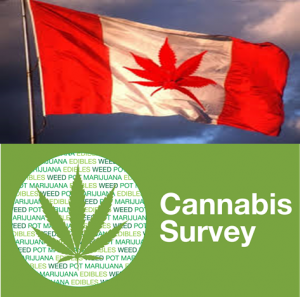 Findings from a survey of condo resident thoughts on cannabis use and related rules, by Condo Adviser, are presented. About 600 responses were received. A majority of respondents do not anticipate smoking cannabis in their units. 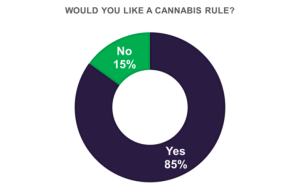 Most respondents want their community to establish rules controlling cannabis use. Editor’s note: Cannabis consumption can be controlled, not prohibited, by passing one or more rules. Condo communities may prohibit consumption by amending the declaration. Legal counsel can help determine which approach is most appropriate. 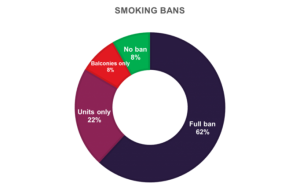 A majority of respondents desire a full ban on cannabis use. 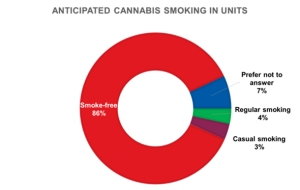 A small minority of respondents desire unrestricted use of cannabis. 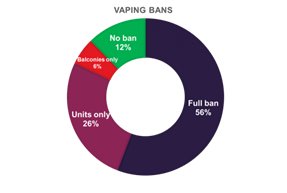 A majority of respondents desire building restrictions on vaping similar to cannabis. 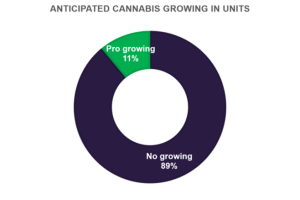 Most respondents do not anticipate growing cannabis in their units. 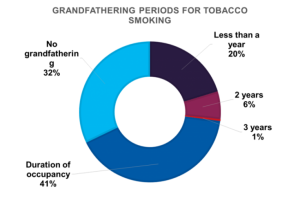 For tobacco, respondents feel restrictions on tobacco use should be accompanied by a grandfathering period for current residents. A grandfathering period may be viewed as appropriate for cannabis use for those communities implementing restrictions after legislation took effect.